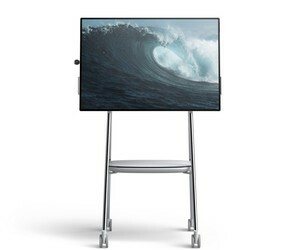 Microsoft’s Surface Hub 2 multitouch display screen collaboration device was designed for teams to connect and ideate, regardless of location. 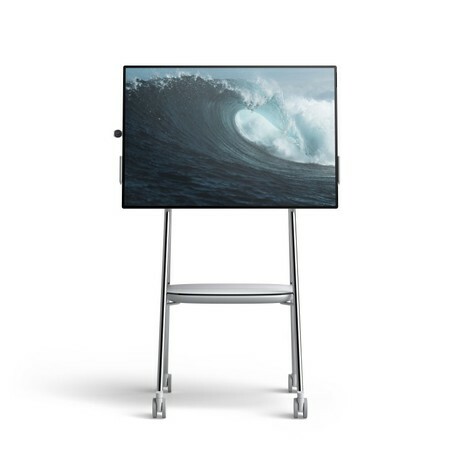 The 4K+ 50.5″ multitouch display creates a canvas to co-create, harnessing the power of Microsoft Teams, Microsoft Whiteboard, Office 365, Windows 10 and the intelligent cloud. The 4K cameras that rotate with the device, integrated speakers and far field mic arrays allow everyone in the meeting to feel as if they are right in the room with the rest of the group, while the standard surface 3×2 aspect ratio means everyone has more usable space to create and collaborate. The product adapts to a space through tiling up to four screens together in portrait or landscape view. Dynamic rotation allows users to use the best orientation for their content to help people work in the way that best suits them and the people with whom they are collaborating. The company worked with Steelcase to create a system of rolling stands and easy-to-use mounts for the screens. Using multiuser sign-in, multiple people can authenticate in the same workspace, allowing them to simultaneously access their documents and ideas, merging them with the ideas of their teammates — and making collaboration as natural as meeting at a whiteboard. I am interested in Microsoft Surface Hub 2 multitouch display screen collaboration device .